Bactria between the Hindu Kush (south), Pamirs (east), south branch of Tianshan (north). Ferghana Valley to the north; western Tarim Basin to the east. Bactria (/ˈbæktriə/); or Bactriana was a historical region in Central Asia. Bactria proper was north of the Hindu Kush mountain range and south of the Amu Darya river, covering the flat region that straddles modern-day Afghanistan, Tajikistan, Uzbekistan, and parts of Northern Pakistan. More broadly Bactria was the area north of the Hindu Kush, west of the Pamirs and south of the Tian Shan with the Amu Darya flowing west through the center. The English name Bactria is derived from the Ancient Greek: Βακτριανή, a Hellenized version of the Bactrian endonym Bakhlo (βαχλο). 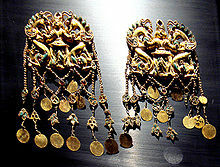 Analogous names include Avestan: Bakhdi, Old Persian: Bakhtrish, New Persian: باختر‎, translit. Bākhtar, Tajik: Бохтар, Pashto: بلخ‎, translit. Balkh, Uzbek: Балх, Chinese: 大夏; pinyin: Dàxià, and Sanskrit: बाह्लीक, translit. Bāhlīka. The Bactria–Margiana Archaeological Complex (BMAC, also known as the "Oxus civilization") is the modern archaeological designation for a Bronze Age culture of Central Asia, dated to c. 2200–1700 BC, located in present-day eastern Turkmenistan, northern Afghanistan, southern Uzbekistan and western Tajikistan, centred on the upper Amu Darya (Oxus River), an area covering ancient Bactria. Its sites were discovered and named by the Soviet archaeologist Viktor Sarianidi (1976). Bactria was the Greek name for Old Persian Bāxtriš (from native *Bāxçiš) (named for its capital Bactra, modern Balkh), in what is now northern Afghanistan, and Margiana was the Greek name for the Persian satrapy of Margu, the capital of which was Merv, in today's Turkmenistan. The early Greek historian Ctesias, c. 400 BC (followed by Diodorus Siculus), alleged that the legendary Assyrian king Ninus had defeated a Bactrian king named Oxyartes in c. 2140 BC, or some 1000 years before the Trojan War. Since the decipherment of cuneiform script in the 19th century, however, which enabled actual Assyrian records to be read, historians have ascribed little value to the Greek account. According to some writers[who? ], Bactria was the homeland of Indo-Iranians who moved southwest into Iran and the northwest of the Indian subcontinent around 2500–2000 BC. Later, it became the northern province of the Achaemenid Empire in Central Asia. It was in these regions, where the fertile soil of the mountainous country is surrounded by the Turan Depression, that the prophet Zoroaster was said to have been born and gained his first adherents. Avestan, the language of the oldest portions of the Zoroastrian Avesta, was one of the old Iranian languages, and is the oldest attested member of the Eastern Iranian languages. Ernst Herzfeld suggested that before its annexation to the Achaemenid Empire by Cyrus the Great in sixth century BC, Bactria belonged to the Medes and together with Margiana, formed the twelfth satrapy of Persia. After Darius III had been defeated by Alexander the Great, the satrap of Bactria, Bessus, attempted to organise a national resistance but was captured by other warlords and delivered to Alexander. He was then tortured and killed. Alexander conquered Sogdiana. In the south, beyond the Oxus, he met strong resistance. After two years of war and a strong insurgency campaign, Alexander managed to establish little control over Bactria. After Alexander's death, Diodorus Siculus tells us that Philip received dominion over Bactria, but Justin names Amyntas to that role. At the Treaty of Triparadisus, both Diodorus Siculus and Arrian agree that the satrap Stasanor gained control over Bactria. Eventually, Alexander's empire was divided up among the generals in Alexander's army. 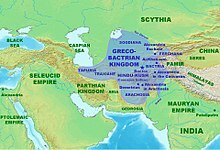 Bactria became a part of the Seleucid Empire, named after its founder, Seleucus I. Considerable difficulties faced by the Seleucid kings and the attacks of Pharaoh Ptolemy II Philadelphus gave the satrap of Bactria, Diodotus I, the opportunity to declare independence about 245 BC and conquer Sogdia. He was the founder of the Greco-Bactrian Kingdom. Diodotus and his successors were able to maintain themselves against the attacks of the Seleucids—particularly from Antiochus III the Great, who was ultimately defeated by the Romans (190 BC). 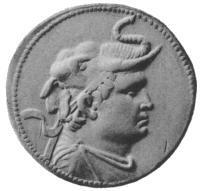 The founder of the Indo-Greek Kingdom Demetrius I (205–171 BC), wearing the scalp of an elephant, symbol of his conquest of the Indus valley. The Bactrian king Euthydemus I and his son Demetrius I crossed the Hindu Kush mountains and began the conquest of the Indus valley. For a short time, they wielded great power: a great Greek empire seemed to have arisen far in the East. But this empire was torn by internal dissension and continual usurpations. When Demetrius advanced far east of the Indus River, one of his generals, Eucratides, made himself king of Bactria, and soon in every province there arose new usurpers, who proclaimed themselves kings and fought against each other. In the Indus valley, this went even further. The Indo-Greek king Menander I (known as Milinda in India), recognized as a great conqueror, converted to Buddhism. His successors managed to cling to power until the last known Indo-Greek ruler, a king named Strato II, who ruled in the Punjab region until around 55 BC. Other sources, however, place the end of Strato II's reign as late as 10 AD. Kushan worshipper with Zeus/Serapis/Ohrmazd, Bactria, 3rd century AD. The form Tokharistan – the suffix -stan means "place of" in Sanskrit – appeared for the first time in the 4th century, in Buddhist texts, such as the Vibhasa-sastra. Tokhara was known in Chinese sources as Tuhuluo (吐呼羅) which is first mentioned during the Northern Wei era. In the Tang dynasty, the name is transcribed as Tuhuoluo (土���羅). Other Chinese names are Doushaluo 兜沙羅, Douquluo 兜佉羅 or Duhuoluo 覩貨羅. In 663, the Umayyad Caliphate attacked the Buddhist Shahi dynasty ruling in Tokharistan. The Umayyad forces captured the area around Balkh, including the Buddhist monastery at Nava Vihara, causing the Shahis to retreat to the Kabul Valley. In the 8th century, a Persian from Balkh known as Saman Khuda left Zoroastrianism for Islam while living under the Umayyads. His children founded the Samanid Empire (875–999). Persian became the official language and had a higher status than Bactrian, because it was the language of Muslim rulers. It eventually replaced the latter as the common language due to the preferential treatment as well as colonization. Control of these lucrative trade routes, however, attracted foreign interest, and in the 6th century BC the Bactrians were conquered by the Persians, and in the 4th century BC by Alexander the Great. These conquests marked the end of Bactrian independence. From around 304 BC the area formed part of the Seleucid Empire, and from around 250 BC it was the centre of a Greco-Bactrian kingdom, ruled by the descendants of Greeks who had settled there following the conquest of Alexander the Great. "Now in early times the Sogdians and Bactrians did not differ much from the nomads in their modes of life and customs, although the Bactrians were a little more civilised; however, of these, as of the others, Onesicritus does not report their best traits, saying, for instance, that those who have become helpless because of old age or sickness are thrown out alive as prey to dogs kept expressly for this purpose, which in their native tongue are called "undertakers," and that while the land outside the walls of the metropolis of the Bactrians looks clean, yet most of the land inside the walls is full of human bones; but that Alexander broke up the custom." The Tajiks are the direct descendants of the Iranian peoples whose continuous presence in Central Asia and northern Afghanistan is attested from the middle of the 1st millennium bc. The ancestors of the Tajiks constituted the core of the ancient population of Khwārezm (Khorezm) and Bactria, which formed part of Transoxania (Sogdiana). They were included in the empires of Persia and Alexander the Great, and they intermingled with such later invaders as the Kushāns and Hepthalites in the 1st–6th centuries ad. Over the course of time, the eastern Iranian dialect that was used by the ancient Tajiks eventually gave way to Persian, a western dialect spoken in Iran and Afghanistan. Chisholm, Hugh, ed. (1911). "Bactria" . Encyclopædia Britannica. 3 (11th ed.). Cambridge University Press. pp. 180–181. ^ Eduljee, Ed. "Aryan Homeland, Airyana Vaeja, in the Avesta. Aryan lands and Zoroastrianism". www.heritageinstitute.com. Retrieved 2017-09-07. ^ a b P. Leriche, "Bactria, Pre-Islamic period." Encyclopaedia Iranica, Vol. 3, 1998. ^ David Testen, "Old Persian and Avestan Phonology", Phonologies of Asia and Africa, vol. II (Winona Lake, Indiana: Eisenbrauns, 1997), 583. ^ Herzfeld, Ernst (1968). The Persian Empire: Studies in geography and ethnography of the ancient Near East. F. Steiner. p. 344. ^ Holt (2005), pp. 41–43. ^ Bernard (1994), p. 126. ^ Grousset, Rene (1970). The Empire of the Steppes. Rutgers University Press. pp. 29–31. ISBN 0-8135-1304-9. ^ "Origin of the Samanids – Kamoliddin – Transoxiana 10". www.transoxiana.org. Retrieved 2017-09-07. ^ "LacusCurtius • Strabo's Geography — Book XI Chapter 11". penelope.uchicago.edu. Retrieved 2017-09-07. ^ N. Sims-Williams. "Bactrian language". Encyclopaedia Iranica. Originally Published: December 15, 1988.